The series of Scholla postings are derived from a tri-weekly newspaper column in the Reading Times. The column, originally titled Scholla aus Pennsylvanisch Dietschland translates to “Echoes from Pennsylvania Dutch Country”. The title was later shortened to Scholla. The author of this column Arthur D. Graeff signed his columns bei ‘N Ewich Yaeger, which translates to “the Eternal Hunter”. 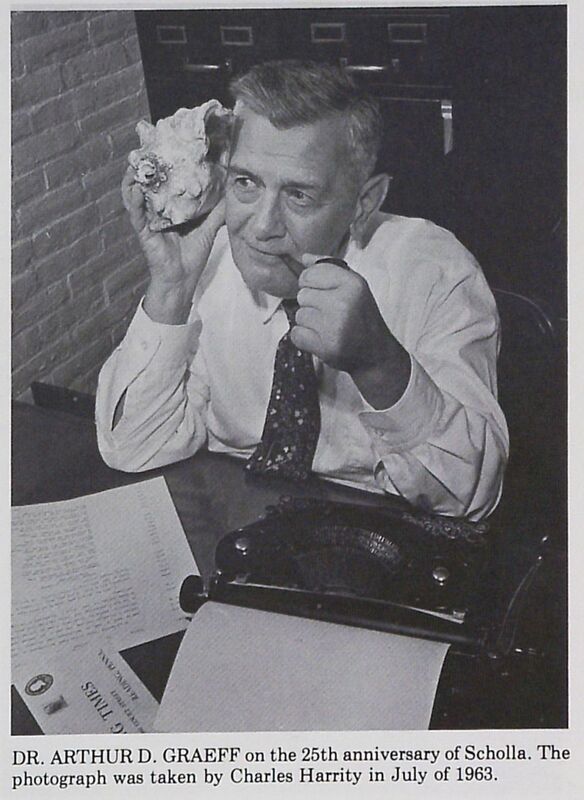 His pen name is very fitting because he wrote his column from July 26, 1938 until the last article being published on the day of his death March 28, 1969. During that time our Eternal Hunter scrounged together material for over 4,800 articles. We at the Berks History Center are excited to expose new generations to writings of Arthur D. Graeff and pay tribute to his work. Due to the elapsed time since the writings of these articles, we encourage our readers to expound on the topics/ideas in Arthur’s articles. Harry Groff making oak splints using his Schnitzelbank. When gypsies come to you with baskets for sale the great likelihood is that the sturdy splint basket they offer were braided and woven by some Pennsylvania German craftsman who learned his trade at the bench or schnitzelbank, somewhere near the Blue Mountains. The nomadic gypsies do not weave splint baskets, or schiene karreb. Their craftsmanship does not extend beyond the manufacture of willow-wicker baskets and hampers. The construction of a splint basket calls for more time, skill and patience that the roving bands of Romany can supply. Harry Groff, of Rehresburg, learned the art of karreb-flechte, or basket weaving from an elderly man who was his neighbor more than a generation ago. The teacher was Frank Eckert, of Bethel formerly from Cornwall, in Lebanon County. Harry Groff is no longer a young man but the knowledge of his craft will not perish with him because he has taught his two grown sons, George Groff, of Robesonia, and Albert Groff, of Bethel, how to split white oak splints, how to operate the ancient schnitzelbank and draw the schnitzelmesser, or drawer knife along a slab of white-oak timber peeling off long ribbons of wooden splints of cardboard thickness. Schiene is the dialect term for splint and any basket constructed from splints is designated as schiene karreb, regardless of its size, shape, or purpose. 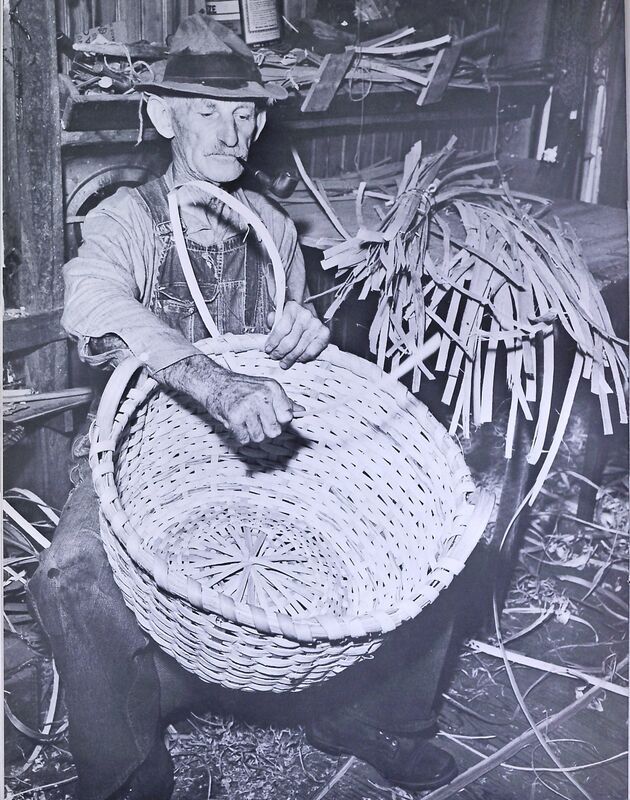 Groff declares that at one time he made willow (weide) baskets, but found that the splint-type would outlast the willow by many years. The first splint basket which he made 35 years ago is still in daily use and in excellent condition. In some sections of Pennsylvania the term schiene karreb is applied only to a basket of very peculiar construction, being built with two convex compartments on either side of a middle peak. This was designed to fit the part of a horses neck just in front of the pommel of the saddle. In this way the basket could rest evenly and eggs carried in the basket would not be rolled from side to side with the swaying movement of the horse. The selection of white-oak timber for splints calls for care and circumspection. Groff says that he cannot use the tree which stands alone. He prefers the oak whose growth was stunted by proximity to other trees in a forest. The tree that stands alone grew too fast and its timber is not tough enough for his purposes. He has tried hickory but found that it does not serve his purpose. Red-oak may serve well for chip-baskets, but only the white oak posses the virtues needed. Neighbors bring their willow “wash baskets’ to Groff to have die henck, the handle, repaired. Without exception the craftsman replaces the broken part with a thick oaken splint, chiseled on his schnitzelbank. 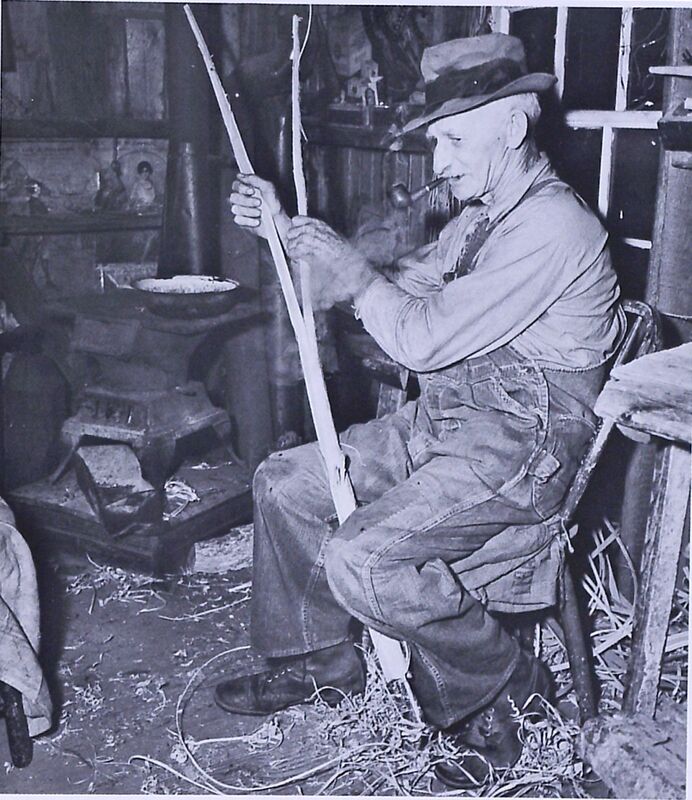 Harry Groff making White oak splints. 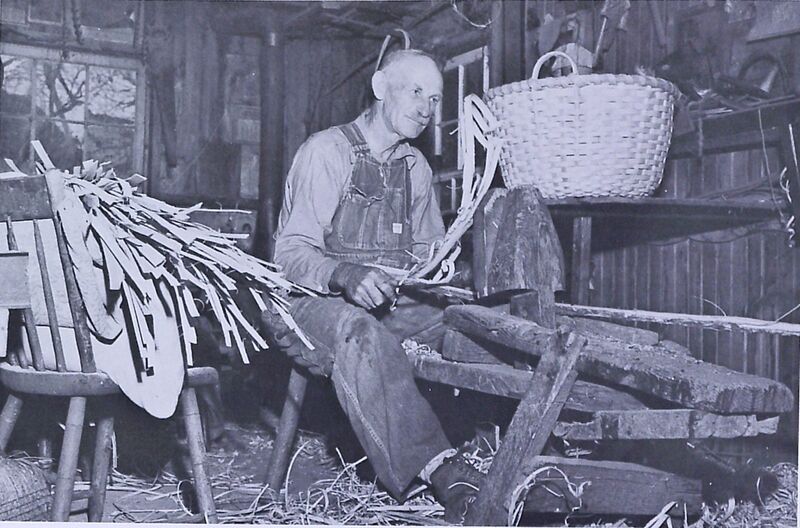 Harry Groff lashing a double rim on a bushel basket.